The technical requirements for low fuel usage and economic efficiency of the vehicle have already been built into the vehicle at the works. ŠKODA places a particular emphasis on minimising negative effects on the environment. It is necessary to take note of the guidelines given in this chapter in order to make best use of these characteristics and to maintain their effectiveness. Fuel consumption, environmental pollution and the wear to the engine, brakes and tyres depend essentially on the following three factors. The fuel economy by can be improved by 10 -15 % by always looking ahead and driving in an economical way. Fuel consumption is also be influenced by external factors which are beyond the driver's control. Consumption increases during the winter or under difficult conditions, on poor roads, etc. Fuel consumption can vary considerably from the manufacturer's data, as a result of outside temperatures, the weather and driving style. The optimal engine speed should be maintained when accelerating, to avoid a high fuel consumption and resonance of the vehicle. All the speed and engine revolution figures apply only when the engine is at its normal operating temperature. A vehicle's highest fuel consumption occurs when accelerating, therefore unnecessary accelerating and braking should be avoided. If looking ahead when driving, less braking and consequently less accelerating are required. If possible, let your vehicle coast to a stop, or use the engine brake, if you can see that the next set of traffic lights is on red, for example. Shifting up early saves on fuel. Drive no more than about one length of your vehicle in first gear. Shift up into the next gear at approximately 2000 rpm. An effective way of achieving good fuel economy is to shift up early. Observe the recommended gear » page 28, Recommended gear. 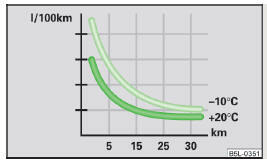 A suitably selected gear can have an effect on fuel consumption » Fig. 108. Depress the accelerator pedal slowly. However, do not depress it as far as the kickdown position » page 108. An economic driving programme is automatically selected if the accelerator pedal is only depressed slowly. Fig. 109 Principle sketch: Fuel consumption in litres/100 km. and speed in km/h. The slower you drive, the more the fuel savings. Sensitive use of the accelerator will not only significantly reduce fuel consumption but also positively influence environmental pollution and wear of your vehicle. The maximum speed of your vehicle should, as far possible, never be used. Fuel consumption, pollutant emissions and vehicle noises increase disproportionally at high speeds. The graph » Fig. 109 shows the ratio of fuel consumption to the speed of your vehicle. Fuel consumption will be halved if you drive at only three-quarters of the possible top speed of your vehicle. In vehicles not equipped with the START-STOP system, turn off the engine when in a traffic jam, at a level crossing or traffic lights with longer wait times. Even after just 30 - 40 seconds you will have saved more fuel than that is needed when you start the engine up again. If an engine is only idling it takes much longer for it to reach its normal operating temperature. Wear-and-tear and pollutant emissions, though, are particularly high in the warming-up phase. Therefore, start driving as soon as the engine has started, In this case high engine speeds should be avoided. 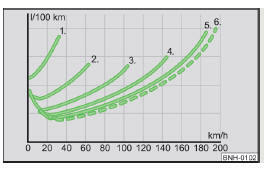 Short distances result in an above-average high fuel consumption. We therefore recommend avoiding distances of less than 4 km if the engine is cold. A cold engine consumes the most fuel immediately after the start. Fuel consumption drops to 10 litres/100 km after just 1 kilometre. The consumption stabilises once the engine and catalytic converter have reached their operating temperature. An important factor in this connection is also the ambient temperature. The graph » Fig. 110 shows the different levels of fuel consumption after driving a certain distance at a temperature of +20 °C and a temperature of -10 °C. Tyres which are correctly inflated save fuel. Always ensure the tyre inflation pressure is correct. If the pressure is too low, the tyres will have to overcome a higher rolling resistance. This will not only increase fuel consumption but also tyre wear and the driving behaviour will worsen. Always check the tyre inflation pressure when the tyres are cold. Each kilogramme of weight increases the fuel consumption. Therefore, we recommend that you carry no unnecessary weight. It is particularly in town traffic, when one is accelerating quite often, that the vehicle weight will have a significant effect upon the fuel consumption. A rule of thumb here is that an increase in weight of 100 kilograms will cause an increase in fuel consumption of about 1 litre/100 kilometres. 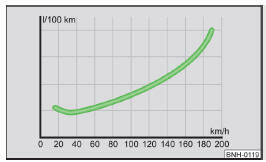 At a speed of 100 - 120 km/h, a vehicle fitted with a roof rack cross member without a load will use about 10 % more fuel than normal due to the increased aerodynamic drag. A poorly tuned engine uses an unnecessarily high amount of fuel. By having your vehicle regularly maintained by a specialist garage, you create the conditions needed for driving economically. The maintenance state of your vehicle has a positive effect on traffic safety and value retention A poorly tuned engine can result in a fuel consumption which is 10 % higher than normal. Check the oil level at regular intervals, e.g. when refuelling. Oil consumption is dependent to a considerable extent on the load and speed of the engine. Oil consumption could be as high as 0.5 litres/1 000 km depending on your style of driving. It is quite normal that a new engine has a higher oil consumption at first, and reaches its lowest level only after a certain running in time. The oil consumption of a new vehicle can therefore only be correctly assessed after driving about 5 000 km. Additional improvements to the fuel economy can be made by using synthetic high-lubricity oils. Regularly check the ground under the vehicle. Have your vehicle inspected by a specialist garage if you find any stains caused by oil or other fluids on the ground. We recommend that your vehicle is serviced on a regular basis by a ŠKODA Service Partner. When the engine is running, the alternator generates and supplies electrical power. If more electrical components of the electrical system are switched on, more fuel is needed to operate the alternator. We therefore recommend switching off electrical components if these are no longer required. Environmental protection has played a major role in the design, selection of materials, and manufacture of your new ŠKODA. Particular emphasis has been placed on the following points. Simplified disassembly due to the modular structure system. Improved purity of different classes of materials. Identification of all plastic parts in accordance with VDA Recommendation 260. Reduced fuel consumption and exhaust emission CO2. Minimum fuel leakage during accidents. Extensive use of recyclable material. Air conditioning filled with CFC-free refrigerant. Reduction in the “vaporisation” of plastics. No CFCs used in the production process. ŠKODA meets the requirements of the brand and its products with regard to protecting the environment and the preserving resources. All new ŠKODA vehicles can be utilized up to 95 % and always 1) be returned. In a lot of countries sufficient trade-in networks have been created, where you can trade-in your vehicle. After you trade-in your vehicle, you will receive a confirmation stating the recycling in accordance with environmental regulations. Detailed information about the trade-in and recycling of end-of-life cars is available from a specialist garage.